Ken (1930 - 2001) was a Grangetown boy from the docklands area of Cardiff. 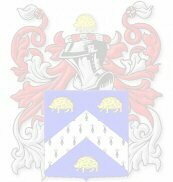 He was the eldest child of Arthur and Gwen Harry and had 10 brothers and sisters, 3 of whom died in infancy. When Ken was nine years old the 2nd World War broke out and his father became one of the Chief Fire Officers in the City of Cardiff. Ken went to school with Roger Delgado (who became an actor most famous for being 'The Master' in Dr Who) and went to Sunday School at the Army with Dame Shirley Bassey - who he remembered making her first public performance singing about Jonah and the Whale! Although brought up at Grangetown Salvation Army he and the rest of the family transferred to Cardiff Stuart Hall Corps in the Hayes district (behind what was, until fairly recently, the 'David Morgan' department store). Ken was a trombone player with the band and also became Deputy Songster-Leader. He recalled 'fondly' being taught to play a brass instrument by Ernie Jones, who gave his lessons armed with a knitting needle to rap across the knuckles if a wrong note was played too often. I guess you learn quickly like that! He became a pattern-maker at Renold Chains before being called up for National Service which he fulfilled in R.E.M.E. By the time his National Service ended Ken had decided to become a Salvation Army Officer and he entered the International Training College in Denmark Hill, Camberwell in 1955 as a 'Swordbearer'. Fellow trainees at the college included the future General of the Salvation Army John Gowans. He was commissioned the next year to Eckington, then he moved to Chesterfield. A keen football referee, he built strong Youth Clubs with champion teams. In his Chesterfield Youth Club team was Jack Bannister and he recommended him to football and cricket teams - he went on to play league football and cricket for England before becoming a BBC cricket commentator and administrator. Ken then moved as Youth Officer to Newcastle City Temple Corps and then to Liverpool Walton in a similar capacity. Following this he spent some happy years on the Isle of Man. It was at a divisional meeting in Liverpool that he met Jean Hedges, a young officer who was singing with Southport Songsters. A courtship followed and they were married in December, 1961. Jean (1940 - ) had been brought up in the Army at Addlestone Corps, her family moving to Hastings in the 1950's to run a guest house. She entered the Training College in 1959 as a 'Greatheart' and was commissioned to Southport to work in a Salvation Army Children's Home there. Prior to officership Jean had worked in Claremont Children's Home and this was a portion of her work which she greatly enjoyed and has left her with many friends and memories she still treasures today. Fred is just one example! After their wedding their first married appointment was at St. Helens Corps. They moved to Coedpoeth in North Wales in May 1962 and in October of that same year Marc Owen was born. This signalled the start of the worst British winter anyone can remember! In 1963 they moved to Clapham, in London. While there Ken had a remarkable experience when called to a domestic incident and had to disarm the husband - such an incident would make the national news today. While in London, Eira Jane was born in 1964. 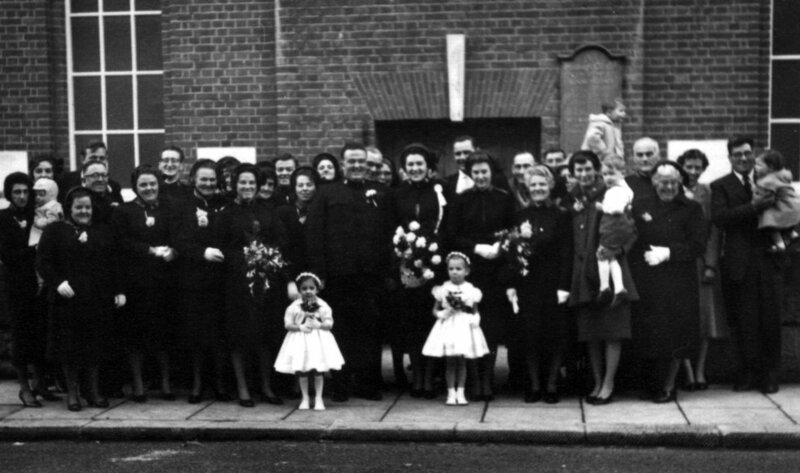 Ivy Harry (Trevor's wife) holding Graham, Joy Webb (of the Joystrings fame - who sang at the ceremony), Gwyneth, Arthur Harry (Ken's dad), Owen (behind), Dorothy, Ray Evans (best man), Gwen Harry (Ken's mother), Pam (Peter's 1st wife), Marilyn, ? , Peter, Gwen, Janet (bridesmaid - Trevor's daughter) Pearl - Jean's aunt (married to Ron), Ken, Major & Mrs. Gilbert Parker (who did the wedding), Jean, Len Hedges (Charles's brother), Mary (bridesmaid - Doreen's daughter), Pauline, Jean's grandfather Jack Hedges, Bessie Hedges (Jean's mother), Ron (Bessie Hedges' brother), ?, Doreen (holding Jason), Charles Hedges (Jean's dad), Auntie Agnes, Brenda and Michael (2 of Jean's best and oldest friends) and their daughter ?. The family moved back to Wales in 1965 being appointed to Newport Central Corps in Gwent. There they had their first family car (a Morris 1000). Prior to that Ken and Jean had travelled by bicycle, with little seats for Eira and Marc attached accordingly. 2 years later it was into the Rhymney Valley to a little mining town called Bargoed - a strange appointment for the Army to make as Ken's brother Trevor Harry was the Songster Leader there at the time. Another 2 years and it was up to Yorkshire for a one year stop at Knottingley. Ken's reputation as a 'do-er' was obviously growing - at Bargoed the Hall had needed one new wall - at Knottingley they needed a completely new Hall! Oh...and a new house for the officers to live in! Both missions completed on time the Divisional Commander said "Don't bother to unpack" and they moved across Yorkshire to the lovely little town of Heckmondwike. While in Heckmondwike Ruth Yvonne was born in 1970. Unfortunately, Jean became very ill during her pregnancy with Ruth. Not only did her hair turn white within the space of a year (it's not REALLY your fault Ruth!) but she developed gallstones and was hospitalized for some time soon after the birth. The longest move came next as the Harrys went from the North of England to virtually its Western tip, Camborne in Cornwall (see picture of Marc Eira and Ruth in the back garden in Camborne). Marc's musical skills began to flourish in Cornwall and he also passed his 11+ to gain a place at Grammar School. Before he could take it up, though, they had moved again - this time to the lovely seaside resort of Torquay, in Devon. Whilst there, Eira also passed her 11+ and went to Grammar School. Torquay is a beautiful place and the family's main regret two years later when they moved again was that they hadn't made the most of it while they were there. For, when they next moved, it was up to the industrial heartland of England - the soot-blackened and dusty 'potteries' city of Stoke-on-Trent. Tunstall was, probably, the nicest part of the city, as it turned out, and we lived directly opposite a lovely park with 'crown green' bowling lawns right outside our front door. Ken and Marc spent many hours rolling their biased woods across these greens and they also had two league soccer teams to watch on alternate Saturdays - Stoke City (where Marc had his first season ticket) and Port Vale. The three years we spent in Tunstall have to go down amongst the happiest times we had together...and Marc fell in love...so the Army moved us again! Up, up and further up - North of Newcastle to another mining town, Bedlington. We had never heard of this particular corner of 'Geordieland' but it was, once again, a very lovely and friendly place to live. The Corps at Bedlington was unlike anything we had ever seen before - there were more than 70 in the songsters and the band blew loud enough as to sound like a hundred! But there was 'soul' in the music, too! As the BM Jim Burn conducted hymn tunes the tears would stream down his face and the people worked for the extension of God's Kingdom harder than any other folk I've ever met. If ever people lived out their Christianity it was the people of Bedlington. In 1981, Marc left home for college and took up musical studies at Colchester Institute where he gained a BA (hons.) degree.. Colchester seemed such a long way from Bedlington - and the Army moved Ken and Jean all the way back down South to nearby Suffolk and Felixstowe Corps. While they were living there Eira left home and returned to her cockney roots in London. As Marc finished college the family moved once again to Portsmouth and, without ever intending to do so, he found himself living at home again. When the family left Pompey in 1987, he stayed there and he has remained there ever since. In May, 1987 Marc married Heather Joy - and Ken, Jean and Ruth moved to Southampton Shirley Corps - where Marc's new in-laws were soldiers. It made family visiting rather easy for Marc and Heather in the first few years of their married life together! In 1990, Ken and Jean went back one more time to Wales and returned to Wrexham, where Marc had been born 28 years earlier. While they were there Marc and Heather gave Ken and Jean their first grand-child when Morgan Owen was born in July 1991. After two years in Wrexham it was back to the Midlands and to Dudley. Ruth gave birth to Kira-Jane in August 1992. By this time, Eira and Heather were also pregnant and they gave birth (both by section) within a week or so of each other in February 1993 - Lewis John being quickly followed into the world by Luke Shane. 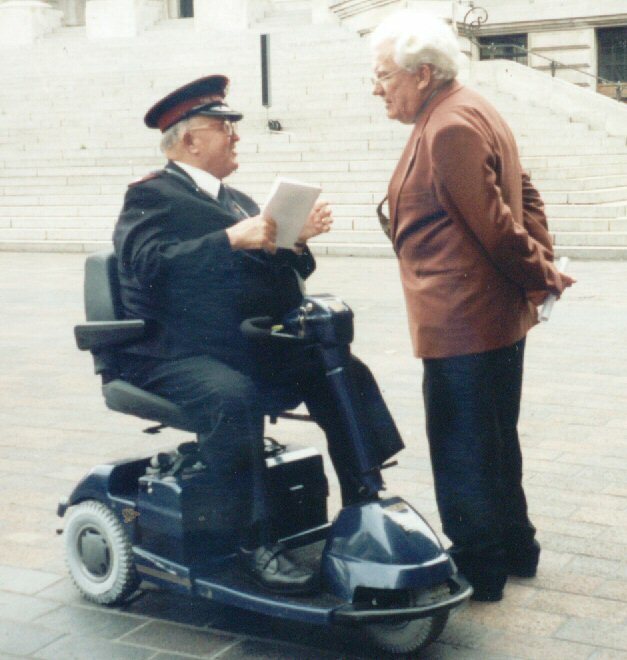 All the excitement was too much for Ken and, on the first day of the Salvation Army's Annual Appeal 1993, while enveloping the Dudley district, he suffered a stroke which, at first left him partially blind and extremely confused. He was told he would never drive again and we were all extremely worried as his memory, speech and just about everything else seemed confused and damaged. Almost miracle-like, his sight returned and he was well enough to take part in both Lewis and Luke's dedication services just a short time later - but his active days as a Salvation Army officer were numbered. He entered retirement 18 months early in Autumn 1993 and he and Jean moved to Reading to live. The house in Reading was unlike any house the family had ever shared before - in a private road with a garden at the back which seemed to go on for ever...and a bit further. Good job mum likes gardening! While she was busy in the garden Ken did some of the things he loved to do as he continued his recuperation. Permitted once again to drive by this time, he began cricket umpiring again. Having been a type II diabetic for some 25 years by this time Ken knew all too well that he had to look after his feet. he was somewhat shocked then, to have had his toe cut by a careless chiropodist/nurse at the hospital in Reading. The cut stubbornly refused to heal and, after a few months confined to a hospital bed he had to undergo a below-knee amputation of his left leg. (It might be said by some that it it was a shame that the 'Where there's a blame there's a claim' adverts had not quite arrived on British TV by then as the consequences of that toe cut were now of massive proportion to the family.) The wound was healing well and it seemed that Ken was to make yet another successful comeback...then, just before the final check he suffered a nasty, fall - the re-opened wound took a further six months to heal this time. All this time he was like a prisoner in the downstairs room of the Reading house which had steps up to the front and steps at the back as well. 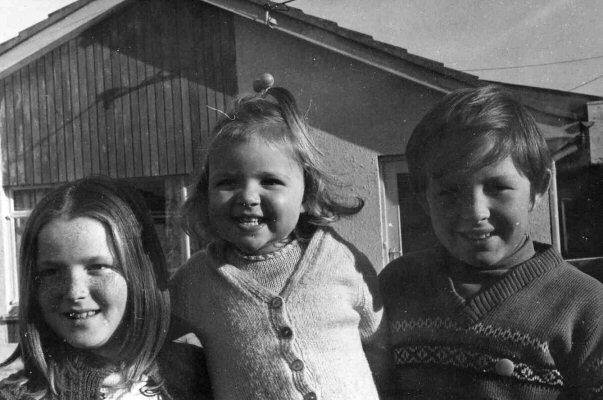 Eventually, the SA took pity on them and allowed them to choose a more suitable bungalow - they moved back to the Portsmouth area to be nearer to Marc and Heather and they remained in Cowplain until Ken sadly died in April 2002. Despite the loss of his leg Ken walked with the aid of sticks and also drove both the car and his electric scooter, paid for by friends at Dudley. Until shortly before his death he continued to climb the two flights of stairs necessary to reach his season ticket seat at Fratton Park. He had even begun to walk without sticks. Unfortunately, in Autumn 2001, the temporary ramp he used to wheel himself out of the house gave way and he fell out of his chair, breaking his hip. Being unable to walk for some time after the accident he clearly suffered for the lack of regular exercise. We - and his doctor - thought he was putting on weight and did not realise the 'weight' was water symptomatic of heart failure. 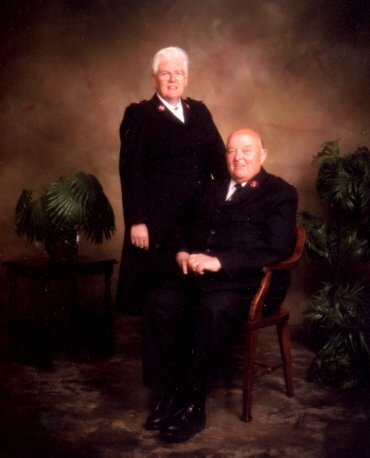 In December 2001, just 4 months before dad died Ken and Jean celebrated their Ruby Wedding anniversary. A party was held in a Chinese restaurant in Southsea and much clicking of chopsticks was there heard! He continued to be as active as he could, rarely missing an Army meeting or a Pompey match - he even came with me to Selhurst Park for an away match less than a month before he died! Eventually he was given some medication but it was far too little and way too late. He died in April 2002 surrounded by his family who sang hymns and songs around his bedside as he went to meet his Lord. The tribute placed in Salvation Army newspaper 'The Salvationist' is reproduced here. Eira married Danny Hammond in April 2002 (the day after dad's funeral) and they live, with Luke in Biggleswade, Beds. having moved from Snodland, Kent. They have a lovely log cabin in the garden with a wonderful Jacuzzi! They are soon to move again to Lincoln. Ruth and Gary Bell were married in May 2004. They live in a new house in Cowplain with daughter Kira-Jane. Sadly Marc and Heather separated after nearly 19 years of marriage in March 2005. They remain friends and see each other most days but it remains to be be seen what the future holds for them.